I seriously can't believe this is PPF already. My week flew by. I did manage to get a few art pieces done and some leather sculps that I will show next week. First a big thanks to Eva and Kristen for hosting Paint Party Friday. I am looking forward to seeing what all the artist have created this week. Nicole! Happy March! Your face is truly beautiful! I think your yellow paint went in all the right places! Cool piece of abstract art! Big Hugs! Beautiful portrait and a happy accident! This week really did fly by, Nicole. It's hard to believe it's March. I like your sketch and I feel that the yellow paint is fine. A lovely piece of art. Happy PPF. a lovely portrait sketch. 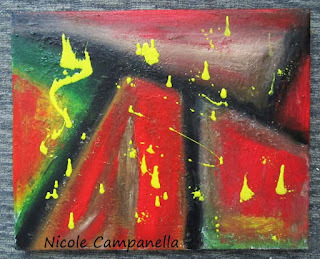 And a happy accident made for a wonderful looking abstract Nicole! Happy PPF and have a great weekend! This portrait is just wonderful! Great abstract piece! A wonderful portrait and a cool abstract piece Nicole! Happy weekend! Hey, Nicole, the abstract is fabulous! I like all the random yellow bits where they have landed. Your sketch is beautiful too. You know I am a great admirer of the faces you draw. The yellow spots are fine and impressive, Nicole! Beautiful portrait and painting. I really love your portrait this week. The yellow slash on the left really attracts my eye! I think you had fun! Love the portrait and you know most often small accidents lead us to great results. So keep it up! Love the portrait drawing! I want to try to do some portrait work soon! I like the combination of the geometrical abstract background with those random yellow splashes. Sometimes "accidents" give the best results :-) Lovely girl portrait too! Happy PPF! The weeks do fly by! Love both pieces, so very different from each other, which is an awesome thing to be able to do! Lovely portrait and fun creation ~ the yellow works! 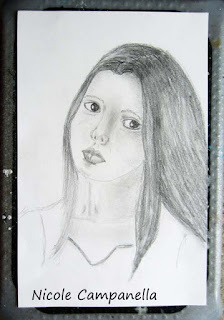 Lovely graphite portrait. Her expression is wonderful. I think your accident with the yellow paint was a happy one. It works. Hope you have a good and sunny week!